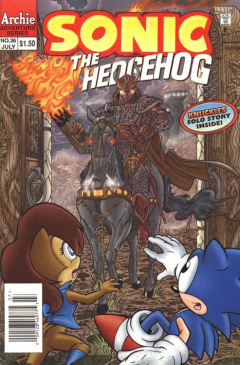 Sonic the Hedgehog 36 is the thirty-sixth issue of the Sonic the Hedgehog comic. This comic features one story: "Heart of Darkness". This issue also features the Knuckles' side-story "A Sense of History", part 6 of the story. The Freedom Fighters look on a monitor in Rotor's lab of a space-like zone. An unknown horse-backed being with a javelin slowly approaches the monitor. It flies by an asteroid, blasting it with a shot from its javelin, shocking everybody. Sally Acorn asks Rotor what exactly they are looking at. The view is from the Zone of Silence, after Rotor sent a camera there some time prior. Sonic recalls being sent into the zone by Snively, but it didn't look anything like what is being shown on the monitor. Rotor believes Sonic was sent to a different zone than the one they are looking at. In Sonic and Robotnik's case, the dimension they were sent to allowed them to easily be returned back. On the other hand, any attempt to retrieve Maxmillian Acorn from the Zone of Silence resulted in failure. The other issue is that Robotnik referred to the area as The Void, making Sally even more curious as to why he called the zone that name. Rotor walks over to one of his consoles and activates the holographic sensor grid to get more details on Robotropolis, thinking something is up with Robotnik. The sensor grid brings up a 3D model of Robotropolis, and is adjusted for all signal wavebands. The Freedom Fighters witness as a ton of magnetic fields are being released by Robotnik, and they are having an effect on the Zone of Silence. Sonic volunteers to go to Robotropolis to stop Robotnik's plans. She agrees, but tells him not to rush into anything. In Robotropolis, Robotnik is, indeed, working on a project. He and Snively have a great power emitter aimed at a doorway, firing and activating a portal. He orders Snively to turn the emitter to full power. Sonic runs into the lab and ties up Snively, just as he turns the machine up to full power. Robotnik turns around, witnessing Sonic kick the emitter. Using a laser on his wrist, he fires at Sonic, but misses as he avoids the shots. He then spindashes and destroys the emitter. Robotnik calls out to duck, as the machine starts to overload. All three of them run and cover behind a console, right as the emitter explodes. Robotnik, looking at the damage, calls out to Sonic that, because of the emitter's destruction, all of Mobius will be destroyed. This leaves Sonic confused, as Robotnik claims that he has a world to save. Robotnik claims he was attempting to take care of the Zone of Silence, but Sonic had gotten in the way. However, Robotnik has another way to close the zone: an energy inhibitor, a can-like object. By activating it in the proper place, it can save Mobius and have the King returned. Sonic doesn't fully trust Robotnik, but with the fate of Mobius at stake, he agrees to help. He's also curious about what happened to Kodos, but that is one thing Robotnik won't tell him. Sonic runs off back home, to do Robotnik's dirty work. Not trusting Robotnik's technology, Rotor scans the energy inhibitor. He determines that it is supposed to do what Robotnik has said, but he can't figure out how it works. He recommends that it only be used as a last-resort. Despite the risk of using the inhibitor, Sally feels that they must save her father. With the inhibitor at hand, despite Antoine's misgivings, Rotor activates the portal to the Zone of Silence. Sally, Tails, Sonic and Antoine enter into the zone. As they enter the Zone of Silence, they start floating through an endless space. Although they get disoriented by this at first, they eventually adapt, and just in time, as the horse-backed knight and his goons have arrived. The knight orders the Freedom Fighters to surrender or face the consequences. Sonic takes the situation less than serious, expecting a better greeting. The whole situation makes Antoine quite nervous, as usual. The knight grows impatient, and prods Sonic with his javelin, demanding an answer to his question. Sonic decides to even up the odds and takes out the goblin-like goons with his super speed. Unfortunate for Sonic, the super speed doesn't deter the knight, who aims his javelin and prepares to fire on him. Sally notices the knight preparing to fire and runs at him, knocking him off his horse. The force knocks off the knight's helmet, revealing to Sally that the knight is actually her father, Maximillian Acorn. Sally is stopped from the shock of the situation, giving Maxmillian the chance to hit Sally back with his javelin. Sonic goes to stop him, but is halted by Tails and Antoine. Despite not knowing who they are or who he is, they do not want Sonic to attack their King. The King orders Sonic to surrender again, with Sally in a daze and the energy inhibitor beside her. At the end of the King's javelin, Sonic takes one shot and dashes for the energy inhibitor, just missing the blast from the javelin. He grabs the inhibitor and activates it, causing a massive explosion in the zone. The Freedom Fighters are launched back, however, Rotor notices that they are going to miss the zone exit. He runs into the portal with a grapple and fires it at the group. They grab the lifeline in time and return home. As they walk out of the portal, they realize that they may be safe, but not the King. They'll just have to return to the drawing board, and figure out how to rescue him again. Knuckles, on his search for the Chaotix and the mystery of Archimedes, recalls the formation of the ominous Mount Fate from Dimitri removing the power of the Chaos Emeralds in the Floating Island. The one thing that confuses Knuckles is how Mount Fate is connected to Archimedes. He thinks that maybe the answers lie in what happened after the formation of the mountain. After Dimitri absorbed the power of 11 Chaos Emeralds, he held Edmund, the Chief Magistrate and his security guards hostage, tied to the his own chamber's wall in Mount Fate. Despite what he had done, the island remained floating and he had infinite power in his hands. Edmund could not believe what he had saw, denouncing Dimitri as his brother. Dimitri, however, wasn't scathed by the comments, with an overinflated ego. Dimitri had taken full control of the mecha-nauts in Echidnapolis, similar to Robotnik in the present, enslaving all the echidnas on the island. His plan also included setting up sails on the island and taking control of all the denizens on the planet. Dimitri then mentioned that the only thing that could withstand his power was the walls of the chamber. Unknown to him, the wall was prone to fire ants, which had already eaten away most of the walls. The effort of the fire ants caused the foundation of the chamber to start to collapse, freeing the hostages. Despite what he had done, Edmund tried to convince his brother to follow them out, but was too late as Dimitri was bested by a falling roof. The others escaped Mount Fate, as it collapsed. The Chief Magistrate realized that they owed their life to a simple creature, and not to technology. Realizing that their society focused too much on science, the Chief Magistrate thought that they should revert back to their roots. In the shadow of Mount Fate, the Chief Magistrate officially renounced technology. Following that day, the large cities on the Floating Island were demolished and a guardian of the sole remaining Chaos Emerald was appointed, starting with Edmund. This tradition passed on through generations, up to the present day with Knuckles. However, Knuckles thinks that there's still one point about the legend that he has forgotten about. He eventually remembers it, the Grand Observatory. Not wanting to totally get rid of all their advancements, the echidna culture had gathered examples of their culture and buried them in an underground city...under Mount Fate. It then finally comes to Knuckles that that city could be the location of Archimedes and the Chaotix. He marches on, using the lessons he learned from his past to help his future. Continued in Knuckles Mini-Series 1. This is the first issue edited by Freddy Mendez. Maximillian Acorn is introduced in person. Kodos is introduced by name.